Canadian milkvetch at the top shows the branched leaf stems. The small plant directly below it is locoweed. This is the whole locoweed plant. Note how the leaves, and flower/seed stalks all grow from the crown of the plant at ground level. It can happen anywhere in the west. It can even happen any time of the year. You watch your horses moving and one of them isn't keeping up, acts clumsy and stubs his toe over and over. Something's sure wrong, but what? 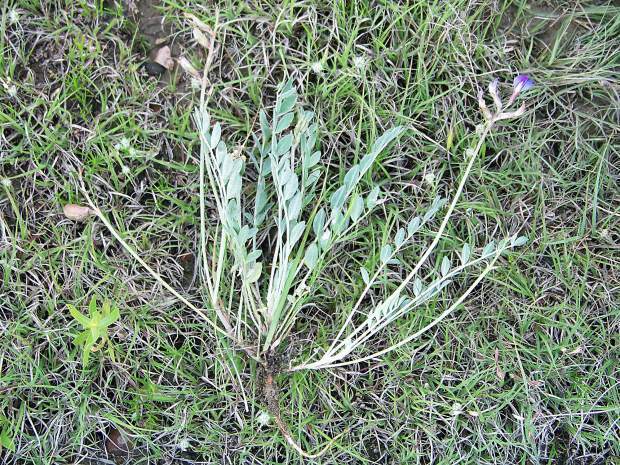 Locoweed poisoning isn't usually the first things a person thinks of, but maybe it should be. 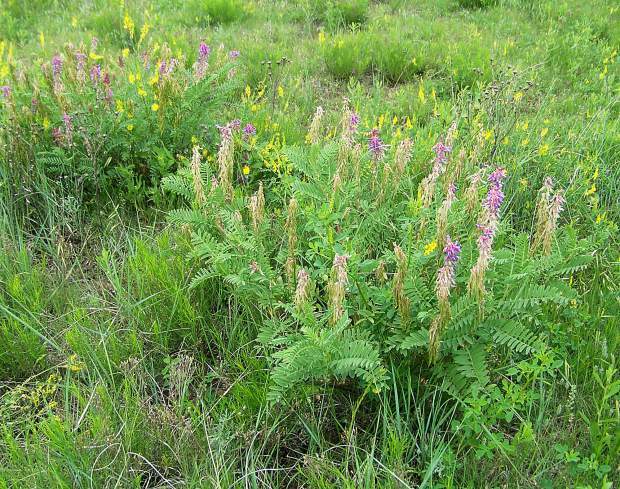 Locoweed, also known as rattle weed, milkvetch, and other names, is the most widespread poisonous plant in the western part of the United States. With over 300 species of the native weed, it's no wonder it's found nearly everywhere in North America, though not all are poisonous. 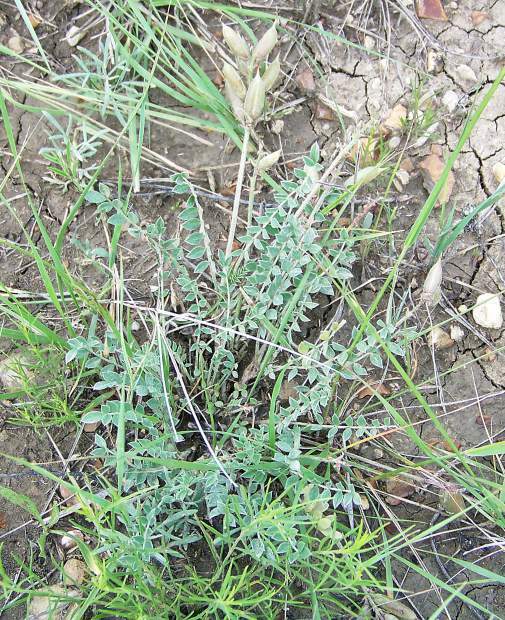 The major players in the locoweed family are Astragalus and Oxytropis genera, and they cause a substantial economic impact on livestock producers, with as much as $300 million lost annually due to deaths of poisoned livestock. Locoweed can poison horses, cattle, sheep, goats, elk, and even cats. Signs of poisoning do not become evident until an animal has consumed a significant amount of the toxin, and usually takes several weeks to do so. 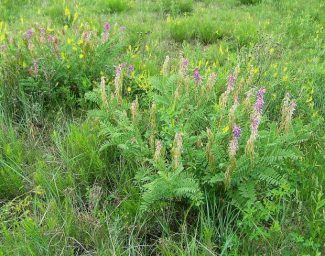 Horses appear to be more susceptible to the toxicity of locoweed than cattle or sheep. A horse that has locoweed poisoning will show early signs by being severely depressed, very inactive, and will stand and appear to be asleep much of the time. Other general signs of less severe locoism include poor condition, decreased fertility, and deformed premature foals. The longer an animal is eating locoweed, the more pronounced the symptoms become. These will include weight loss, odd behavior, such as being head shy, startling suddenly, and overreaction to things around them. Some horses will rear up and flip over backwards and exhibit other dangerous behaviors when handled. Other neurological problems include ataxia and the loss of normal body movement, incoordination, an abnormal high stepping gait and head bobbing. All of these behaviors make horses dangerous to be around due to the close human/horse association and their sheer size. Unlike other poisonous weeds, locoweed is relatively palatable and animals will graze them right along with other grasses and weeds once they get used to the taste. Oddly enough, the feed value of locoweed is quite high with some of it testing at 18.4 percent crude protein. Locoweed is one of the first plants to "green up" and will even during a drought. 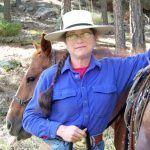 In one study done in Arizona, cattle and horses were both grazed on loco infested rangeland during the spring season of April to June. During the 47-day study, the horses ate more of the green vegetation than the cattle, which were more likely to graze more of the dry grass from the season before. The horses also grazed the locoweed sooner than the cows in the study and their consumption increased over time as they developed a "taste" for it by habituation to the weed. The causative factor in locoweed poisoning is an indolizidine alkaloid called swainsonine, which is the toxin responsible for the pathological changes in the body tissues that lead to the condition known as locoism. Every part of the plant, including seeds, flowers, foliage, and even pollen, contain some level of swainsonine, and studies have found that even the dried plant stems can retain sufficient swainsonine to pose risks for a year or longer. The locoweed plant itself doesn't produce the swainsonine, incidentally, but instead it is an endophytic fungus that grows in every part of the locoweed plant. Swainsonine inhibits certain cellular enzymes called lysosomes, which causes the accumulation of sugars within the cellular organelles that digest intracellular waste products. This decrease in function leads to an increase in the size and total number of lysosomes in the affected cells. Those in turn cause fluid-filled cavities called vacuoles to form within the cell that disrupt the normal cell function. From the diagnostic point of view, the presence of these vacuoles in white blood cells may be indicative of acute poisoning within 48 hours of the exposure. The vacuoles in the brain and neural tissue, endocrine glands, reproductive organs and viscera occur with more chronic and intense consumption of the locoweed. The clinical signs of locoism appear when an animal has eaten 0.3 mg per kilogram of body weight, or in more understandable terms. An 1,100 pound horse has eaten 150 mg of the swainsonine. Since swainsonine is a rapidly absorbed water soluble toxin, it is excreted through the animals urine and also the milk in lactating animals. Young animals are more severely affected than mature animals as they are more susceptible to the swainsonine. Blood testing done on horses that are still grazing on the infested pasture will show a diagnosis if done within 24 hours of removal from the pasture. The short sample life makes it imperative to test while the horses are still digesting the locoweed in their system. Even though the swainsonine will diminish in the blood and tissues, the damage done to the brain and neural tissues is permanent and the impairment of the horse, whether behavioral, physical or of the reactive type, will remain. Less severely affected horses may be able to return to a relatively normal condition after several months, though they may retain some of the lesser signs, such as being stumbly and dragging their hind feet so that the hooves are squared off across the toe. Locoweed prefers a prairie environment and will grow in any soil type, usually on better drained areas. The plants are stemless with the leaves and flower stalk growing from a crown at ground level. The leaves can be 4 to 10 inches long with 7 to 19 linear leaflets on each leaf. 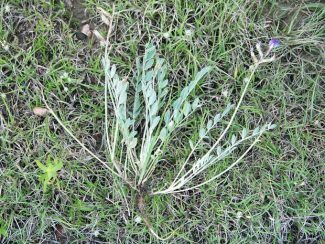 It is bluish-green in color, somewhat like sage, and has a pinkish or purple five petaled flower at the end of a stalk and resemble an alfalfa blossom. The seed pods are a shiny, light brown kidney shaped pod. Silver lupine, which is much taller and has a different leaf structure and somewhat different flower can be mistaken for locoweed. It is toxic to livestock but is generally avoided as it is unpalatable. 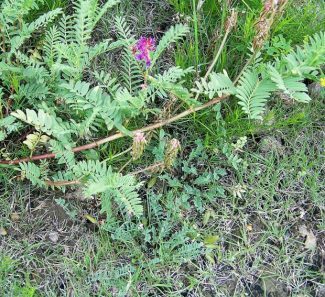 Canadian milk vetch is another that is often thought to be locoweed. It is has a more bushy plant that can grow up to four feet tall and has a purple or white flower stem on it. It's leaves branch off of central stalks, as does silver lupine. It isn't palatable or poisonous and the flowers have a strong, unpleasant smell. Scouting pastures for locoweed is tedious, but worth the effort. Eradication is possible but one has to be persistent as it is a perennial legume that reproduces by seed so annual spraying for several seasons is necessary. With no proven or effective treatment for locoism, and the poor prognosis for recovery of a locoed horse, it is recommended that horses be kept out of pasture with locoweed and if that's not possible, to provide plenty of other forage to keep them from becoming dependent on the locoweed to fill their grazing needs. Toxic Plants of North America by Burrow, G.E. and R.J. Tyrl, A Guide To Common Locoweeds and Milkvetches of New Mexico, NMSU Cooperative Extension Service by Fox III, W.E., K.W. Allred and E.H. Roalson, 2003 Toxic Plants of Texas by Hart, C.R., T. Garland, C Barr, b.B. Carpenter, and J.C. Reagor, Equine Clinical Nutrition: Feeding by Knight, A.P. BVSc, MS, DACVIM, Locoweed control: Aerial application or ground by McDaniel, K., K. Duncan and D. Graham, Grazing of spotted locoweed by cattle and horses in Arizona by Pfister, J.A., B.L. Stegelmeier, D.R. Gardner, and L.F. James, Effect of previous locoweed intoxication on conditioned taste aversions in horses and sheep, Pfister, J.A., B.L. Stegelmeier, C.D. Cheney, and D.R. Gardner.